In Srimad Bhagavat Gita, Krishna acknowledges his bhaktas as Rasikaha Bhuvi Bhavukaha . 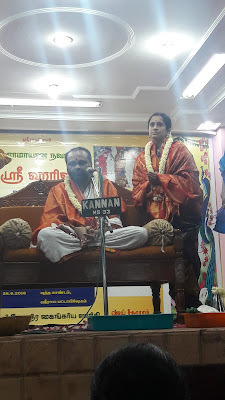 Likewise, Sri Hari Anna also commenced his upanyasam by honouring us with the title of Rasikas and also distinguished it with Bhavukas, who would experience overwhelming emotions ( Ananda Bashpam ) upon hearing the katha. 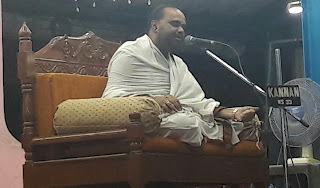 The katha started with Raja Parikshit urging Rishi Sukar to elaborate on Krishna Leela, when Sage Sukar completes it by quoting mere 10 verses. 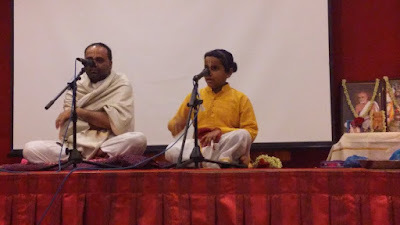 Raja Parikshit persuades him by enlightening him that, listening to Krishna Leela is the sole purpose of his life. Kamsa, the notorious king of Mathura , son of King Ugrasenar, arranges the wedding of his sister Devaki with Vasudhevar, the Yadhava king of Chandravanshi clan. Amidst the wedding procession, an Asiriri ( aakashvani / oracle) warns Kamsa of his Mrithyu ( death) at the hands of the 8th son of Devaki. Kamsa spares Devaki's life upon Vasudhevar's promise to hand over his 8th son to him. However, Kamsa imprisons both of them. All the 6 births of Devaki meet their doom but, the 7th child gets transferred to the garba of Rohini in Mathura. 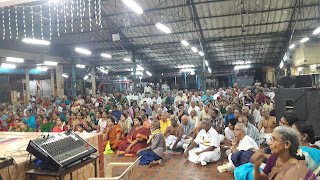 Finally when Devaki breaks down contemplating her fate, Bhagwan Vishnu emanates as Shanka Chakra Gadha Dhari and gives Darshana to Mata Devaki and Vasudevar on Shravana masam Krishna paksham rohini nakshatram at midnight in a baalaka roopa. This marked the birth of Krishna or Krishna Jananam. Krishna jananam not only signifies the birth of Krishna, but also symbolizes the birth of nganam ( knowledge) in our minds. When Krishna directs Vasudevar to relocate him to Gokulam and bring Yashoda's child with him, Vasudevar enacts his orders without a 2nd thought of suspecting or questioning how things were going to transpire. The shackles tied to his arms and feet fall off, the door breaks open, Yamuna splits herself to give way to Vasudevar who was carrying little Krishna. This stands as an example to prove that, when Krishna is the player, obstacles themselves choose to clear the path . Hence our only dharma or duty is to trust him and his doings and follow his leadership. When Kamsa comes to kill Devi Maya, who was bought from Gokulam, she kicks him on his chest and warns him that his kaal (death) has been born and is safe somewhere. 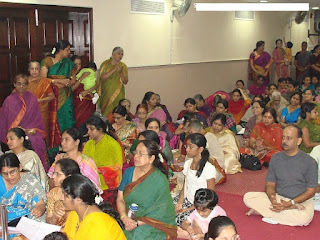 Krishna's Janmotsavam is celebrated the next day. Little Krishna is put to settle on the cradle studded with navratnas and diamonds which was gifted by Lord Brahma. Krishna's naming ceremony takes place when even Rohini's son is named, as Balarama. Krishna assassins various rakshasas sent by Kamsa like Putanai, the maiden who tries to feed poison to Krishna, Shakatasuran, who used Krishna's cradle as his weapon, Trinavarta, who takes the form of a whirling storm and many others. But he also grants moksha to all of them . Krishna's joyable and adorable leelas with the Gopikas , where he breaks the butter, milk and curd pot tied to everybody's house was also recited. This shows that Krishna will climb any heights to break the agnyanam developed in the minds of his Bhaktas. The upanyasam started with the katha of Yashoda's divine vision. When the beloved leader of all i.e. Krishna puts mud in his mouth, his friends complain of this to Yashoda Ma . She hastily comes to scold him but, the glimpse of the divine vision leaves her perplexed. In the tiny mouth of little Krishna she visualizes the never ending cycle of the astronomical Brahmand, in that the Braratha Khandam, in that a Gokulam, in that a Yashoda with Krishna's mouth open in that again a Brahmand and so on. Just when Yashoda becomes conscious of Krishna's divinity and goes to touch his feet, Krishna makes her forget the Leela, leaving only the experience with her. Krishna's only motive behind this was, not to hamper the compassion his mother has for him. Krishna also satisfies Brahma's wish by performing a Leela with him, when Brahma fails to witness one. Brahma kidnaps all the children and the animals of Gokulam to Brahmaloka. Krishna replies to this act by taking the form of all the children and the jeev jantoos to prove that he is sarvamayam ( omnipresent). The animal families expanded and they showed greater affection to their kids . This scene left Brahma dumbstruck when returned a year later. Finally when he gets enlightened of Krishna's leelai, he goes on praising him and Krishna ends his leelai. The following katha was Govardhana leelai which was intended to break the garvam of Lord Indra who floods Gokulam with rain when Krishna instructs the villagers to perform pooja to the Govardhana hill instead of Indra. Krishna provides shelter to all by lifting the Govardhana hill on the tip of his little finger. 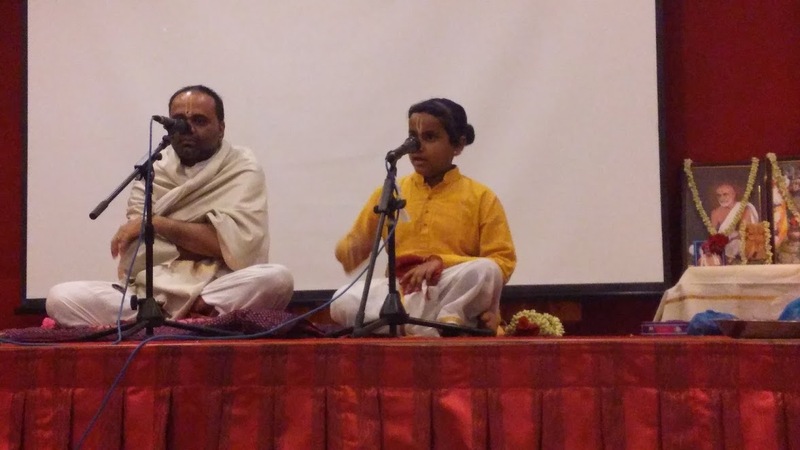 Consequently, he gets the name of Govardhana Giridhari. 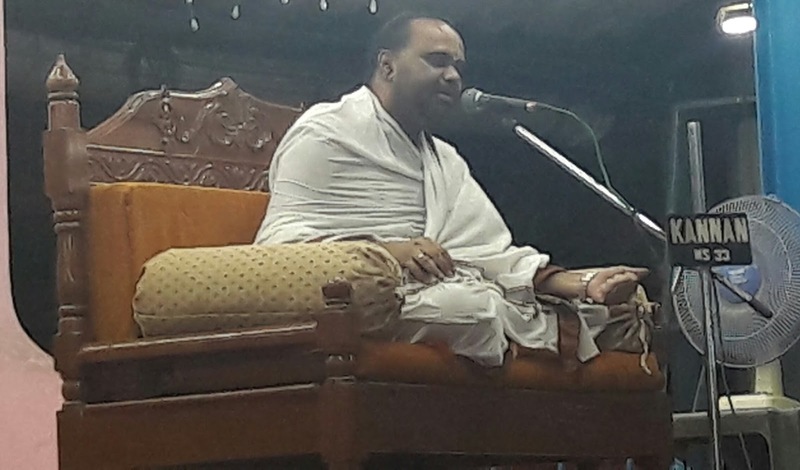 During the discourse, Sri Hari Anna had also communicated an important message from Krishna's Vastrabharanam leelai . This act of Krishna intended to make the Gopikas surrender their body made of the pancha bhoothas to Krishna. He showed the path to salvation through samarpanam. 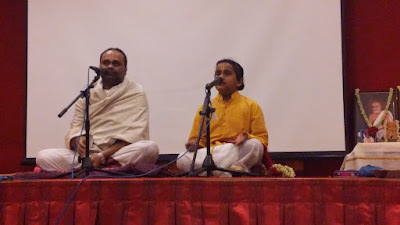 The katha of Kaliya Nardhanam was recited by Sri Hari Anna's son, Chi.Raja Gopal. When Krishna dives into Yamuna to get the ball fallen in it, the 100 headed serpent, Kaliya captures Krishna. Krishna emerges out of the water and performs Nardhanam on all the naga's head. While all the villagers and the children were apprehensive, Balarama remained calmed. Would 1000 headed naga (Vasuki) ever fear a 100 headed serpent? Soon Krishna overpowers Kaliya and sends him out of Gokulam. This proves that Krishna will keep trying to break the garvam of his bhaktas as and when they emerge ( like the heads of Kaliya). Due to Krishna's mischief, Yashoda maiyya ties him to a wooden mortar with great difficulty, as his punishment. Angry little Krishna drags the mortar along with him to the forest and breaks free 2 Arjuna trees by entering in between them. He liberates the 2 sons of Kubera, Nalakubera and Manigriva who were enslaved in the trees due to a curse bestowed on them because of their indecent behaviour with sage Narada, in their intoxicated state. 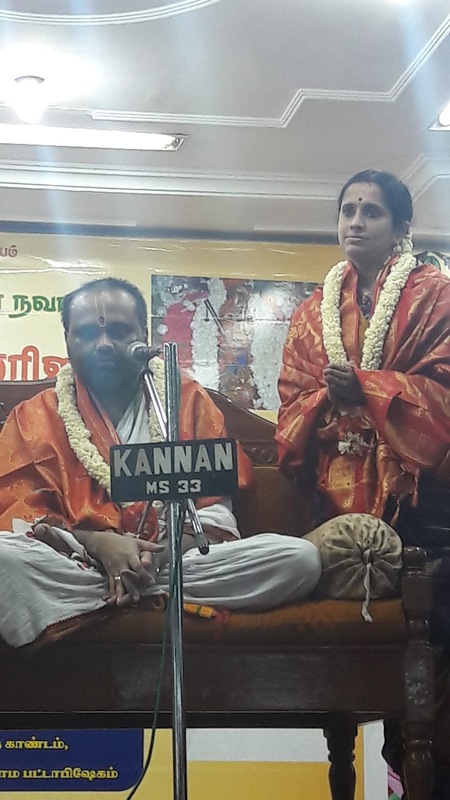 They plead to Krishna to keep them away from ku-sangathi and always provide them Nama sankeerthanam and nyanam. One day while all the children were herding their cows, the hungry kids in search of food go to the cottage of the Brahma Patnis . Upon hearing the arrival of Krishna, the patnis leave everything and come to meet him . Krishna blesses them and sends them back. Witnessing the Bhakti of their wives, the Yagna Brahmans forgo their ignorance and seek the Lord's pardon. The Bhakti of the Brahma patnis is an evidence that the chetna or thought of the Lord itself will relive us of all our dilemma. Sri Hari Anna had also described the mesmerizing Tribhangi body position of Krishna. When all the Gokulwasi shift to Brindavan, Krishna performs the Raasaleelai with all the Gopis and Radha. Hearing the melodious tune of Krishna's flute, all the Gopis leave their chores half way and come running to him. The Lord performs Raasam with all the Gopis and Radha. Arrogance and pride will leave us with nothing. All the happenings in the world are credited to and by the enlightened one. We have no claim over our fortune or misfortune. This is the very lesson Krishna wanted the Gopis to understand when he vanishes from the raasam when all the Gopis think proudly of their fortune of dancing with Krishna. When he had defeated the Kama ( power of Lord of love) in all of them, he reappears and continues the raasam. At this time Kamsa gets the news of Krishna and orders Akrurar to bring him to Mathura. Akrurar, who had always awaited an opportunity to see Krishna, blissfully proceeds to Gokulam. Upon his arrival, Krishna and Balarama do seva for him. The next day when Akrurar leaves with all the children, all the Gopis especially Yashoda and Radha sob and sends them with a heavy heart. During their journey, Krishna and Balarama give Darshan to Akrurar while he does his sandhyavandhanam . This shows that if one duly does his duties, the Lord will never let go off him. When they arrive at Mathura they are greeted by many like the tailor, the garland weaver, an old woman and many others. All of them offer their services to Krishna. 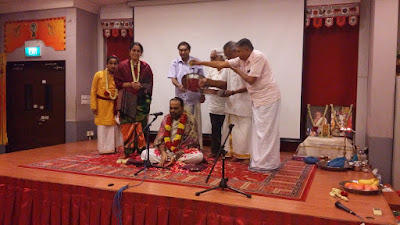 Krishna breaks the dhanush that was meant for the Dhanuryagyam. Kamsa Vadhanam takes place after Krishna and Balarama kill mushtika and chaanoora. He also releases his parents from the prison. This is followed by Krishna's Paatasalai. katha, where he learns 64 kalai (arts) in 64 days and returns his Guru his long lost son as his Gurudakshina. 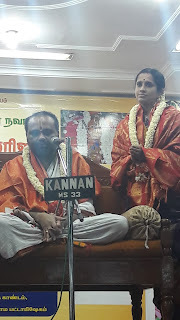 Sri Hari Anna had ended the Upanyasam with the beautiful Rukmini Kalyanam. Rukmini, the daughter of the King of Vidarbha, had grown up listening to Krishna Leelai and consequently devoted her life to the devotion of her love, Krishna. Though her father gave consent to her marriage with Krishna, her eldest brother , Rukmi disapproved this. He chose Shishupala as her groom. Devastated by this news, Rukmini sends a letter to Krishna through a Brahmin. Krishna asks the Brahmin itself to read it in the same emotion. The letter read, Sruthva guna bhuvana sundara... . It had addressed the universally beautiful, Krishna and directed him to came on the day of her marriage and take her away with him. Krishna executes the plan and kidnaps Rukmini from the Devi's temple in his chariot to marry her. The army that had come to attack him had 1st witnessed this magnificent scene and then took their weapons. The army was handled by Balarama and Krishna solemnly married RukminI. Sri Hari Anna explains that this avataram of the supreme lord is to show the myriad ‘ leelais’ to this world. Alert from the sky !! Sri Hari Anna beautifully dwelves into the ‘state of mind’ that Vasudev is when Kamsan decides to kill Devaki as stated below. superficial love that Kamsan has been exuding for his sister. As he raises his arm to kill Devaki ,Vasudev goes through multiple emotions from helplessness to trepidation to save his newly wed wife. Finally , he chooses ‘Vivekam’ over ‘Bhayam’ and advises Kamsan to kill every child that is born to the young couple to ensure no enemy of Kamsan is alive. This brilliant ‘on the feet’ thinking not only saves his beloved wife, it provided us ‘bhakthas’ an opportunity to experience the multitude ‘ leelais’ of Krishna from Mathura to Gokulam. Inspite of being fooled, Kamsan did not rest till he made multiple attempts to have the ‘balkrishna’ killed. Each of his messengers of death only ended up getting moksha at the hands of the Lord. Krishna’s fondness for butter is succinctly elucidated in the story of Udupi Krishna. The young Krishna always sought undivided attention of mother Yashoda, who would carry on her duties diligently. Once while curdling curd, as she was unable to divert her attention to the continuous yearning from the young lord, so he showed his leelai by tightly holding the churning stick with 1 hand, a task too big for any small child but not for the almighty. It is this posture of the lord that we see in the divyakshetram of Udupi, a scene not visible anywhere else. Lord Brahma, the creator of this world was eager to watch Krishna Leelai in person and he decided to hide all Brindavan folk in his abode. Considering the huge distance between Brindavan and Brahmalog, it took him some time to come back. In contrast to his expectations, Brindavan was abuzz with the sound of village folk and cattle stock. This completely confused Brahma who couldn’t comprehend this miracle. Unknown to him , Lord Krishna had created an illusion of recreating all the brindavan niwasis in both the places at the same time. To provide him with a glimpse of his leelai, Krishna immediately showed himself in all the people around Brindavan. Wherever Brahma could see, there was Krishna all around. Having seen this supreme leelai of the lord , brahma brought back all the original niwasis to brindavan. 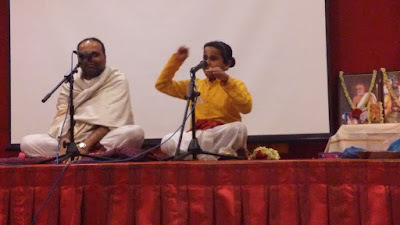 Kalinga snake story was beautifully rendered by little Rajagopal which enthralled the audience. The way he quoted various slokas and the final kalinga narthanam gadhyam from Sri Anna’s grantham was splendid. 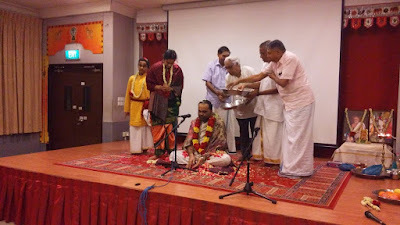 Hari Anna then continued with brindhvan Gopikas prema Bhakta towards Krishna. During Raas leelai Krishna suddenly disappears. This is because gopis saw devas waiting above and watching the leela which gave rise to thought in their mind “ Krishna is in our hand and is not with them” . 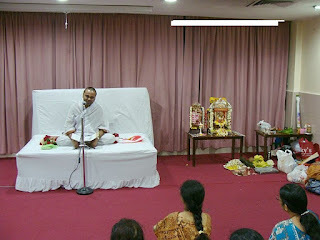 Here the vakyanam goes that had they just thought that “Krishna is in our hand” then he would not have left them. Further Sri Anna vakyanam in this place goes as had the gopis thought that “Krishna has held us” rather than “Krishna is in our hands” would have made Him more happy. Krishna’s uncle ,Akrurar , longed to meet the lord in person and seek his grace. But the fear of King Kamsan never gave him the courage to visit brindavan. To his utter surprise, Kamsan instructed him to visit Brindavanam and bring Krishna who has slayed all the mighty asuras sent to kill him. 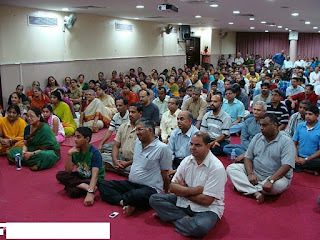 Without hesitation akurar set off with boundless happiness to see the Lord. Sitting amongst a bunch of friends ,Akurar wasn’t able to identify the young Lord, but Krishna the enchanter came upto Akurar and holding his hand addressed him as ‘Chittappa’. Akrura’s joy knew no bounds as he felt blessed in the divine presence of the lord. In another incident, the lord tricked Shisupal and Rukmi and married Rukmini who is the incarnation of goddess Lakshmi. Smt Vishaka Hari rendered a beautiful sangeeta Upanyasam on Guruvaoor appan leelai on the occasion of 17th anniversary of Sri Vishnu sahasranama Laksharchana at Global Indian International School Dubai on 1st December 2017. She started off with Bhishmas advice to Darmaputrar and then the importance of sahasranamam. The way Lord Ranganatha was worshiped by Lord Rama similarly Lord Adikesava was worshiped by Lord Krishna in Dwarka who was then brought by Guru and Vayoo to mummiyoor and is now known as Guruvayoorappan. There are various devotees to Guruvayoorappan but as stated in sahasranam “ kim japan muchyethe jantu” in recent past an elephant named Kesavan also was a great devotee of Lord Guruvayoorappan. Sri Hari Anna delivered Sri Krishna leela pravachanam at Ayodhya Mandapam , Chennai from Jan 7th to 13th of 2018. 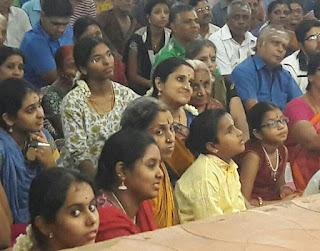 It was organised by Vyagrapuri Seva Samothi. Many devotees drank the elixir of devotion. 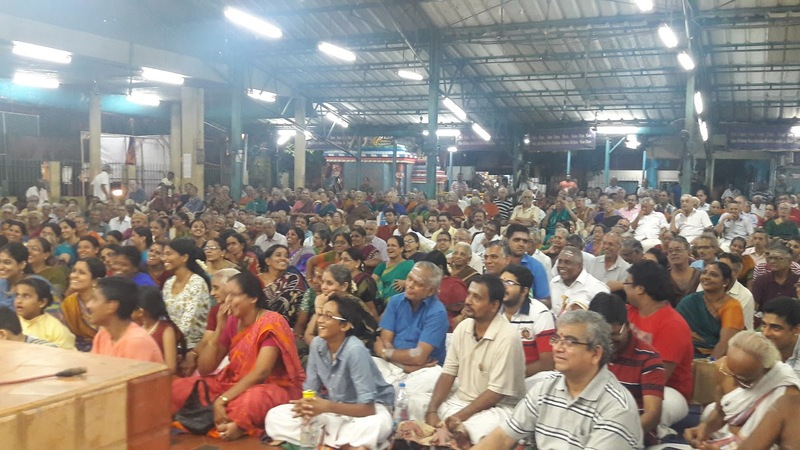 Brahma Sabha, Singapore conducted the discourse of Sri Hari Anna at the Sivan temple, Geylang, from Jan 21st to 25th of 2018. It was attended by the rasikas of Singapore with great enthusiasm. 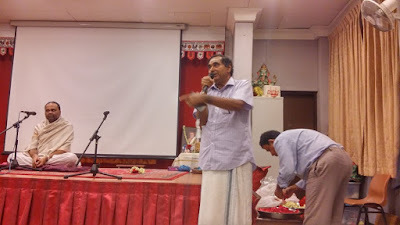 The topic was Ekadasa Skandam and every word he uttered was like medicine to the injured wounds of tantalised minds.